Phylogenetic Tree of the Order Caryophyllales. Copyright (c) 2017 Makoto Honda. All Rights Reserved. * Did this happen in aquatic or terrestrial environment? 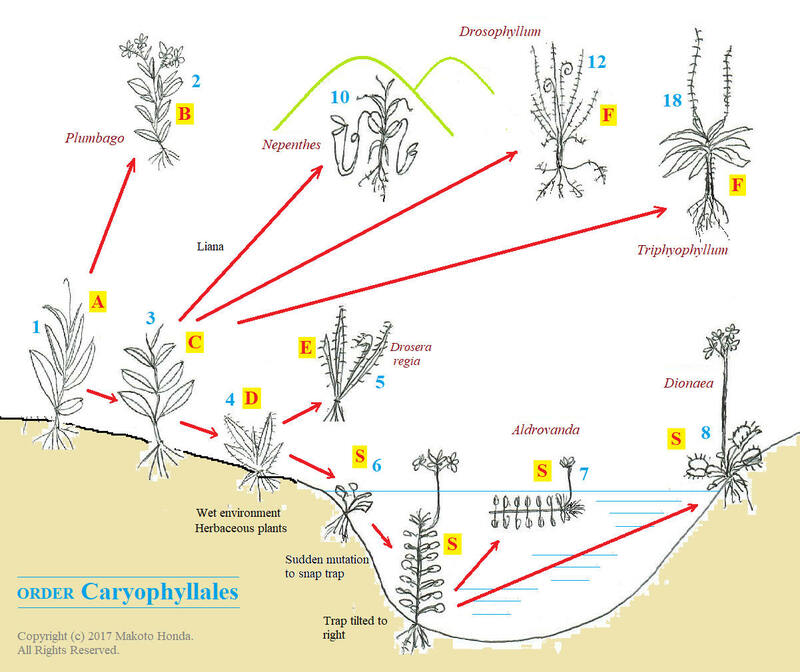 Carnivorous Plant Evolution Within the Order Caryophyllales. Copyright (c) 2017 Makoto Honda. All Rights Reserved. 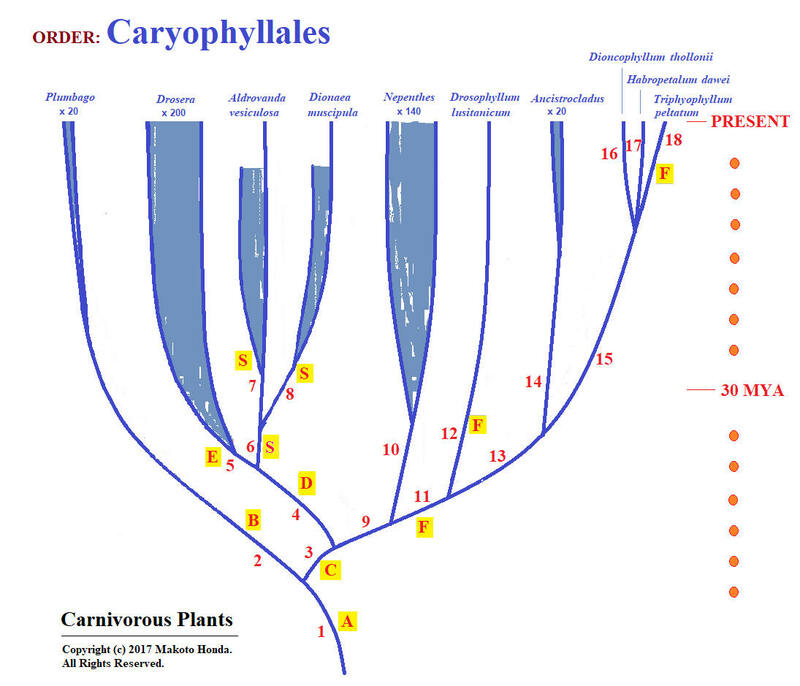 In the order Caryophyllales, a precursor to carnivory started out as a primitive adhesive trap, probably to protect their reproductive organs (flowers). That allowed prey capture but did not provide any means of absorbing the nutrients from the captured prey. Eventually primitive sessile glands developed that were capable of absorption (only), as in today's sundews. The sessile glands further developed into secreting digestive enzymes, as seen in Drosophyllum and Triphyophyllum today. In Drosera, on the other hand, the stalked glands acquired the additional ability to perform digestive function (secretion of enzymes and resorption of digestion products). The tentacle's fluid secretion is switched from the initial mucilaginous glues to digestive enzymes after prey capture. Digestion is typically carried out in the center of the leaf blade where short, central tentacles grow. Numerous sessile glands are also found on the leaf surface of sundews, and along the stalk of a tentacle in some species. It is conceivable, therefore, that the fluids containing the products of digestion drip down from the central tentacles onto the leaf surface, allowing numerous sessile glands to participate in the absorption as well. From the common ancestor (probably an adhesive trap) of all carnivores in the order Caryophyllales, the branch leading to modern Drosera developed a "movement" trait in the stalked glands resulting in so called "active" traps in their tentacle bending (and leaf folding). The branch leading to Nepenthes-lineage (also leading to Drosophyllum and Triphyophyllum) did not develop any such movement (or lost the ability, but unlikely). In Drosophyllum and Triphyophyllum, the stalked glands (without movement) are solely for adhesive prey capture and the digestion is carried out by the sessile glands on the leaf surface. In the order Lamiales, the same division of tasks between the stalked and sessile glands is seen in Pinguicula's adhesive trap. In evolutionary terms, it could be interpreted that the Drosera's primitive sessile glands (only capable of absorption) gave rise to more advanced sessile glands found in Drosophyllum and Triphyophyllum that are capable of secreting enzymes (Juniper et al, 1989). Perhaps, more plausible interpretation might be that the sessile glands in sundews lost their function ---- Drosera's sessile glands are a remnant of obsolete organs replaced by the stalked glands (tentacles) that acquired added capability to perform digestive function (Komiya, 1994). Within the order Caryophyllales it is difficult to assess which is more advanced evolutionarily: the division of tasks (between stalked and sessile glands) seen in Drosophyllum and Triphyophyllum, or the multi-tasking stalked glands in Drosera. However, it does appear the Drosera's tentacles have brought precision and economy in enzyme application. In Drosophyllum and Triphyophyllum (and in Pinguicula), the digestive enzymes are secreted from the sessile glands in the vicinity of the site of prey capture in response to physical/chemical stimulations. Sundews deliver digestive enzymes by way of well-controlled tropistic movement of the tentacles (movement towards the source of stimuli) that enables precision-dispensing of metabolically expensive enzymes to a specifically targeted area --- the prey. This minimizes waste compared with the broad enzyme secretion scheme used in other adhesive carnivores.